When I reminded the President about it, he told me that he had passed it on to his Secretary for comment. His Secretary told me that he had not seen it, so I sent another copy, but the deafening silence continued. It was then that I decided I might as well close my office, since I did not see any point in government incurring expense for something that served no purpose. The enormously helpful Additional Secretary who had done as much as he could to help (though unable to provide salaries that would attract capable staff) told me that what was spent on the office was minimal compared with the general level of government expenditure. But I saw no reason to continue with what had been the only forum to bring together under official aegis a range of stakeholders. I now confine myself to Reconciliation meetings at Divisional Secretariats in the North and East, which I think are vital since no one else seems interested in listening to the people. My colleagues in Parliament have signally failed to have Divisional Development Committees in most areas for many months, and in many instances the people tell me that what is decided on is changed without further consultation or even information. And though only about half of the government departments I write to after the meetings respond, and of those half simply tell someone to report on the problem (which does not then happen until I have sent several reminders), at least in some cases action is taken. But even when nothing happens, people welcome the opportunity to get things off their chest, and also welcome the information that finally reaches them, since generally government officials do not bother, or have opportunities, to convey even the positive measures that are being taken. The government failure to fulfill the President’s commitment to greater grass roots consultation is appalling, but given that such consultation would be inconvenient to most decision makers, I suppose it is understandable that his own very different vision of what government is about is ignored. But making matters worse is that there are no mechanisms for him to get expert advice either, so government functions in a vacuum as it were, neither hearing popular opinion nor studying position papers based on evidence and analysis. I was reminded then in Meghalaya of the absence in Sri Lanka of think tanks. The various thinkers present talked about discussions they had attended in Sri Lanka, at the International Centre for Ethnic Studies and the Regional Centre for Strategic Studies or, in the case of older participants, Marga. But none of these institutions is able to feed into government thinking, unlike in India where CRRID or IDSA or the Observatory Foundation, and several others, prepare position papers that help government formulate policy. Lakshman Kadirgamar tried to change things by building up the Bandaranaike Centre for International Studies, but after his death it went back to being a sort of tutory. I did try, having been one of the ten individuals from different backgrounds he had picked for his Board, to get some high level discussion groups going even after that Board was dissolved. But despite support from the President’s Secretary, the rather passive individuals the President had put in charge (passive in all respects save jealously guarding their turf) sabotaged the effort. I then had those discussions at the Reconciliation Office, and the Secretary of Defence sent some very bright young military officers, but the Ministry of External Affairs was not interested, and the synergies that should have been created lay dormant. Still, the officers produced some excellent suggestions, and I forwarded these to the Secretary of Defence, but by then I think he had gone on the defensive, and nothing was done to take these further. The Lakshman Kadirgamar Institute meanwhile, with massive resources at its disposal, has contributed nothing to policy or practice. Its delightful Director, who is on a par with Research Officers in similar Institutes in India (or Pakistan or Bangladesh) receives little guidance. Rohan Guneratne I believe does his best, but it is difficult to function effectively from Singapore, and there is no one else to provide either ideas or analysis. How sad the situation is became clear with the preposterous reactions to the election of Mr Modi as Prime Minister. A country that took thought and planning seriously would have prepared situation papers beforehand, one looking at what Sri Lanka should do in case the BJP won but needed support from other parties, the other looking at what a majority BJP government would do. By now there should have been analyses by academics to supplement what I hope is a serious effort by the Ministry to get to grips with the implications of the meeting between our President and the Indian Prime Minister in Delhi, as also of the press conference the Indians held afterwards to overcome what they saw as misinformation on our part. Prof Sudharshan Seneviratne, the excellent choice to be our High Commissioner in Delhi, should have been exposed to analyses of developments in India put forward by experts in the field, with debate and discussion as to how to proceed. And our current High Commissioner in Delhi, who has done yeoman service under difficult circumstances (made more difficult I suspect because his sharp analyses have not been passed on to the President) should have been part of such a consultation. But that is not possible since, except for the President alone, everyone in decision making positions is nervous about Dayan Jayatilleka, who knows more about the subject than anyone else. He had been entertained recently in Delhi by our High Commissioner, and they had had a frank discussion, but I don’t think the Ministry would be interested in the substance of such a high powered discussion. Instead they seem content by the effusions of those who thought that Mr Modi was interested only in Northern Indian Hindus and in Sinhala Buddhists and would therefore give us unqualified support – and who now, realizing that they had been talking nonsense (including in their vicious opposition to the President’s choice of Prof Seneviratne) are inveighing against the Sampur Coal Power Plant. Such effusions are given prominence in the government press, and even though the Secretary to the Media Ministry told Parliament, the last time he appeared before the Committee on Public Enterprises, that it was not the policy of the government to attack India, his assurance that the bloodhounds would be reined in has come to naught. Given the influence the Minister of External Affairs exercises over the government press, the implication is that such absurdities have his approval, and it is simply not credible for government to claim that these are merely individual views. 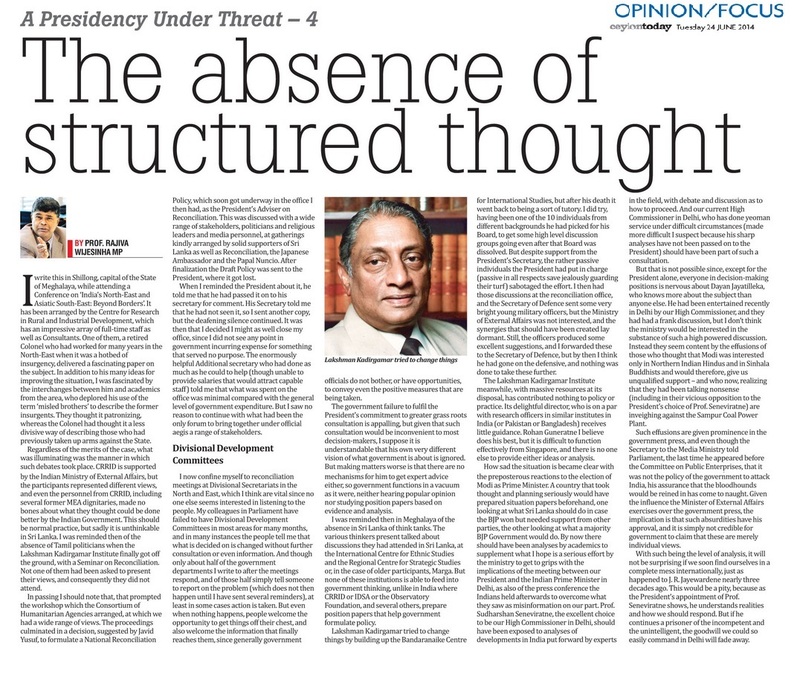 With such being the level of analysis, it will not be surprising if we soon find ourselves in a complete mess internationally, just as happened to J R Jayewardene nearly three decades ago. This would be a pity, because as the President’s appointment of Prof Seneviratne shows, he understands realities and how we should respond. But if he continues a prisoner of the incompetent and the unintelligent, the goodwill we could so easily command in Delhi will fade away. « A Presidency Under Threat 4 – A Move towards Moderation?